When Gabriel and I visited the village soon after we got married in 2011, he was not shy in voicing his concern. Family’s lineage is central in Dinka tradition. Carrying on your name and legacy to your children is what completes you as a human being. 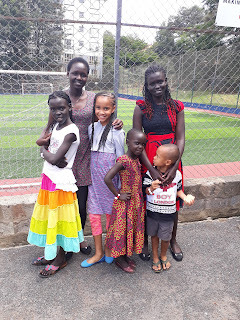 He believed that this American white lady would keep Gabriel’s children away from the village and would forever cut off Gabriel’s ties to the clan starting with our kids. I feel the pressure of getting his approval, changing his perception of me, and having him return to the village with “glowing reviews” of this white American lady. 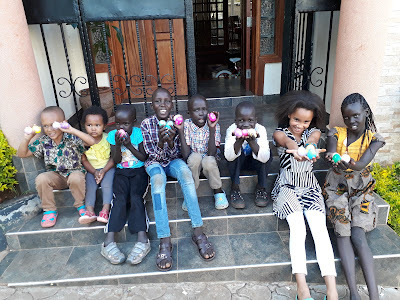 Then, yesterday morning my husband informed me that his cousin, wife, and two small children were on their way to Nairobi. The older child is sick and doctors in Uganda couldn’t figure out what was wrong. 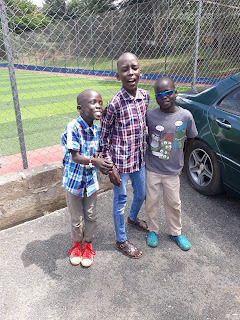 They were on their way to seek better medical treatment in Nairobi. The mother in me recognized that we should welcome them in this time of need. After all, if I needed to seek medical treatment for my kids in Uganda, they would do likewise for me. But the "tired me" questioned, "How long are they staying? How can I possibly make bigger meals that we are already making?" But there was no choice. They needed our help. I moved Awut into our room and prepared her room for them. The "tired me" again complained, "Great! Now Awut will start waking at 5:00am in the morning again!" Regardless, at 8:00pm, we welcomed them and served them a warm meal I had prepared. Come to find out, the older daughter only eats rice and soup. That was not what I had served. They politely asked for rice and soup. Tired me now became exhausted, bitter, and just plain grumpy. I scrambled in the kitchen and served her some rice and chicken broth that she promptly started eating. So, last night I laid in bed feeling bitter and angry. 16 people where sleeping in my house! Over and over in my mind I thought I am not African enough for this! I am not African enough for this! After catching up with his cousin, Gabriel crawled into bed a few hours later. My bitterness came out in full force. I told him to get me tickets back to the U.S. for the kids and I. I would go back to my easy American life. I was done. The next moments turned my perspective around. Gabriel told me about his conversation after dinner with his brother and our two oldest nieces. I had seen them talking seriously and even heard mentions of my name, but the Dinka language is still a confusing string of sounds and words to me. Our clan, the Pakiir clan, was blessed by our Grandfather, Majok Akook. He had 4 wives and raised 15 beautiful girls. They were disciplined, responsible, and kind. When they married, our clan added many cows to our herd. They brought not only wealth, but pride to our family. When our father, Deng Majok, grew up he was a respected man in the community because of the wealth (cows) which he inherited from Majok. More, importantly, we was respected in the community for his generous heart. Our father shared his wealth with less fortunate in the community—he would loan his cows for poor families to provide milk for their children during hard times (seasons) of the year. He moved house-to-house to check-in on many families to make sure that they were okay – and encourage them. Our father was able to marry many wives, our mothers, and our clan swelled with many children including Gabriel and I. Today, we do not have any "beautiful daughters". The only beautiful daughter is Gabriel. He is the only one who is bringing pride to our family. He is caring for our children, your mothers (addressing our nieces and nephews), and using his God-given creative talents to better our future. Since coming here, I can say the same for Elizabeth. Gabriel and Elizabeth are the only “beautiful daughters" we have. They must be cared for. Just like our cows must be well-taken care of in order to provide us with good milk, so do we have to treat Gabriel and Elizabeth. Today, I can see how my sons, the same ones who were emaciated in the village, are now growing healthy and strong. They have more clothes than they ever owned in their entire life in the village. They are happy and cared for. It is never easy leaving your children in someone else's care. But I will return to their mothers in the village and tell them that they are being cared for by Elizabeth just like they would have. My tears turned soft, and my bitterness melted. In that moment, I realized that I was part of something bigger than me. I was part of my husband’s clan’s story. My brother-in-law recognized me and saw the value in what I was attempting to do (even if I accidentally served him lemons for a snack because they look exactly like local oranges). For as long as I could remember, I have wanted to be part of something bigger than me. I desired to live life with purpose. I wanted to make sacrifices knowing that I was making a difference. I realized I was now being given that opportunity but instead of taking the challenges head-on, I was allowing bitterness and anger to paralyze me. I recognize there is grace and that I am only a failed-human who will have her difficult moments and days. But more than ever, I went to bed realizing that opening my home to other clan members in need is part of me living out my purpose in this season. I woke up ready and with joy to prepare 16 cups of chai or hot chocolate, 32 pieces of toast, and 1 strong cup of coffee for me! Lord give me the strength to carry on when I feel like I have nothing left to give. Help me to find joy in the day-to-day and give me your kind of love to pour out on my tiny clan in front of me. I love these boys who love making us laugh! 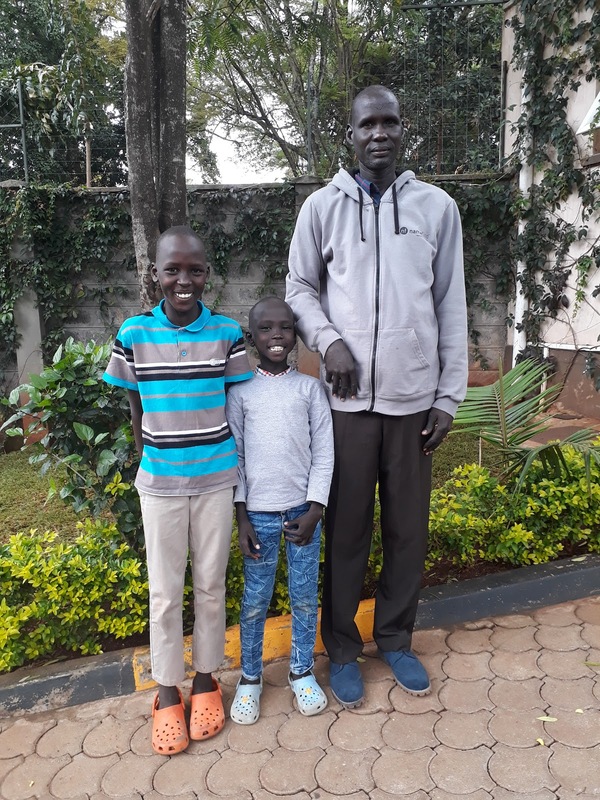 Akook and Majok with their Dad! Easter Egg hunt with the crew! You are an amazing woman Liz .........And I can't wait to see all of you this summer! Liz, sending lots of positive thoughts your way. Your words are heartfelt and honest. To be asked to do so much for so many is a daunting task, to question how much is enough is an honest query. But you truly looked within yourself and saw the strong woman you are and how much you mean to so many they are so lucky to have you looking out for all of them.